Experience Toronto in a spellbinding new way as you witness the city come alive at night, on this 6-hour combined walk and vehicle tour! With your expert local guide see Toronto’s landmarks and experience Toronto’s dynamic artistic pulse and its night rhythms first-hand. With the iconic CN Tower at sunset as your backdrop delve into the heart of Toronto’s famous Entertainment and Fashion Districts and become transported through neon lights, sound, music film and fashion, uncovering a different and more vibrant side of Toronto as the city magically transforms at night. In-between, receive a private reception with drinks atop a landmark building, dine at an evocative restaurant that opens into the city’s entertainment district and end the night with new friends in revelry, sipping late night curated cocktails or sampling beers with locals at a sultry underground speakeasy bar that takes you back in time to the old days of the city. Your entertainment journey begins at 2pm at the Bell LightBox home of the world’s iconic film festival; TIFF. Walk in the footsteps of movie legends as you discover the history and functionality of the building. Continue onward to a behind the scenes private reception with complimentary drinks atop the Festival Building and learn about the movies that are screened during the Toronto International Film Festival that go on to the Oscars. As evening descends witness the cultural hub of Toronto come alive with vibrant neon-lit cafes, pubs and decadent restaurants awakening as you make your way to the inner core of the city. Enjoy dinner at a restaurant frequented by locals and visiting Hollywood celebrities before commencing on a walking tour of the district’s vibrant neon lit Theatre Strip – one of the top three theatre hubs in the English speaking world alongside Broadway and London. Return to the TIFF building where you are taken on a thrilling night tour of Toronto’s Entertainment and Fashion Districts. 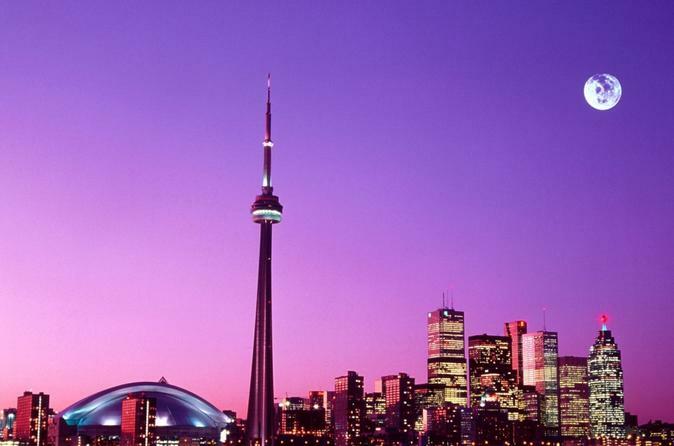 Witness Toronto's famous landmarks lit-up with the CN Tower, Harbourfront, ROM, AGO, Rogers Centre, Air Canada Centre and Hockey Hall of Fame taking on spellbinding characteristics at night. See historic locations such as the Canada Life Building, one of the best examples Beaux-Arts architecture in Toronto and the Campbell House, one of the oldest remaining buildings in Toronto. Enjoy complimentary refreshments on board as you take in the fascinating sights of Toronto. We conclude our memorable tour with a visit to a secret underground speakeasy with an ambiance straight out of a movie set which evokes nostalgia and timeless comfort. Share you tales of the night in fun and revelry with newfound friends as you enjoy a bespoke cocktail, martini or beer for a fitting end to an exciting evening!